The Ocean is My Spirit Animal? It’s been just over three months since I held a real job (Location Independence Day + 3 months = July 4th! ), and I’m still floundering a bit. Partly because I had location-dependent commitments in May and June, mostly because this is all brand new territory for me. How to choose when the choices are seemingly infinite? [Here I should apologize and say thank you to my friends who’ve been listening to me whine about this issue lately. I promise I’m working on it]. Lots of things sound cool, lots of places look interesting, lots of friends have asked when I’m coming to see them (and again, thank you lovely people!). But nothing has said THIS, THIS YOU MUST DO! And frankly, I was expecting something like that. This whole idea was a bolt from the blue, I expected the same kind of pull towards something once I took the big leap. 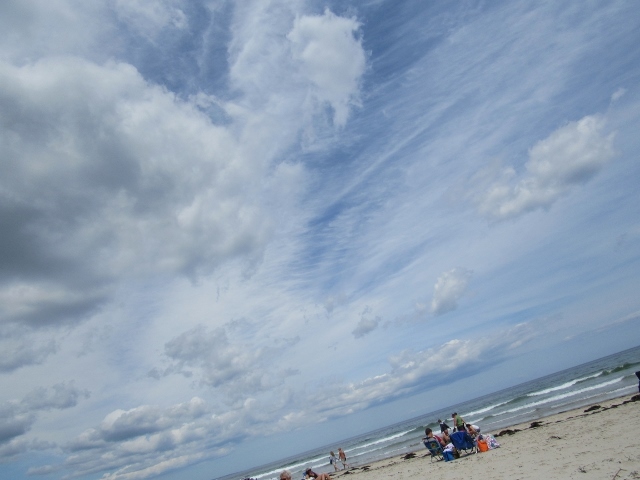 Maine coast, with bonus sky. But, nothing came. And the more people asked me questions like ‘what are you doing next?’ and ‘what is the most interesting/coolest/amazing thing you’ve seen so far?’ the more I realized I hadn’t really seen anything amazing yet, and I had no idea what I wanted to do. You don’t get messages from your future when you’re whining, or when you are running around like a crazy person from one event to the next. You can only hear the quiet voice when you are quiet. It yells very rarely, and only when you’ve been listening to the quiet. Or something like that – my metaphor stopped working back there somewhere. What I’m trying to say is… the ocean. A tiny piece of the view from my favorite bench in the world. Mt. Susitna/ Sleeping Lady trying to peak through the clouds, and the tide is way out. The ocean has been calling me – quietly but consistently – for a long time. In Alaska, whenever I’d feel like I was in a weird head space and needed to figure something out, I’d go to Cook Inlet (15 minutes from anywhere in Anchorage) or Knik Arm (only a bit further). 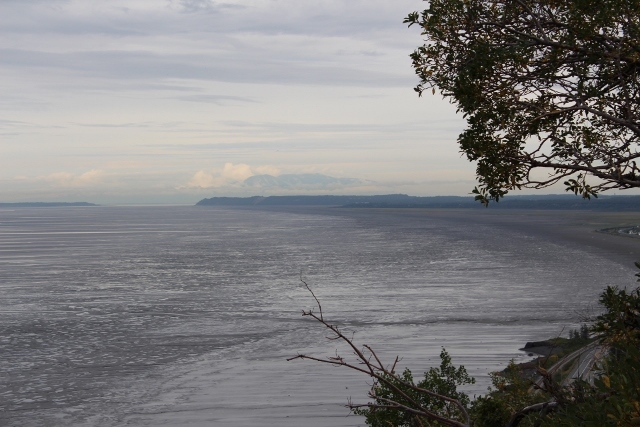 When I moved out of state, I asked Carl to go take pictures from my favorite spot, just south of Anchorage where you could see Knik Arm dump into Cook Inlet (and you can’t see the other side). My first road trip, to test out my little POS, was to the coast of Oregon. 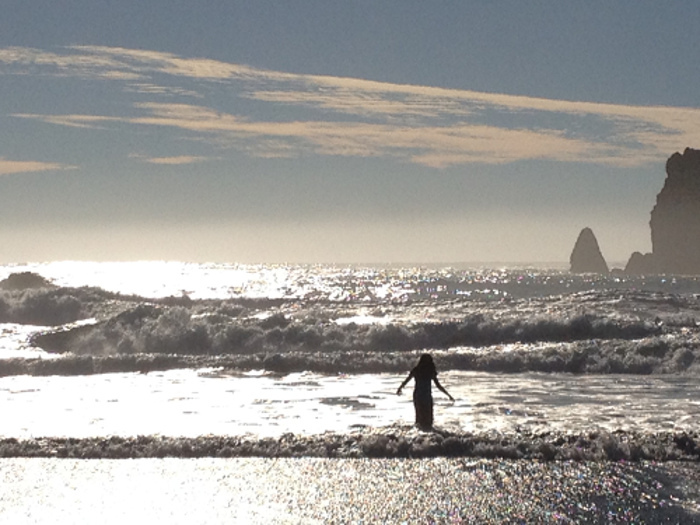 More recently, the coast of Maine looked like heaven, and Lincoln City, Oregon was incredible – even with the cold and the wind. I found a journal entry yesterday – from May 1 of this year – that said straight out that the only thing that called to me was to be at the ocean, alone. Apparently I wrote it and then immediately forgot it. So, that’s it. That’s the next thing, I finally heard it. Now to figure out how to make it happen, at something less than $1000 a week. 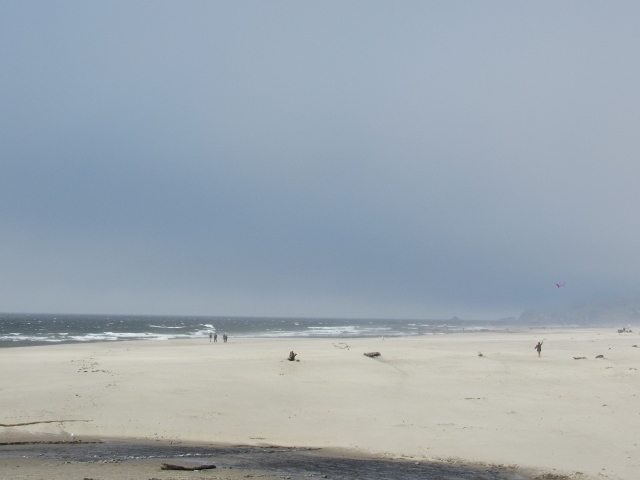 Lincoln City beach in the cold. I believe you will find it when it’s right. The one mantra of my life…do not anticipate, wait for it to show you what you are looking for. I know the feeling of waiting for the next sign, the next step, the direction you are supposed to move in. I’ve found I can depend on it but it requires much patience and faith. Thank you for sharing your journey Bev!